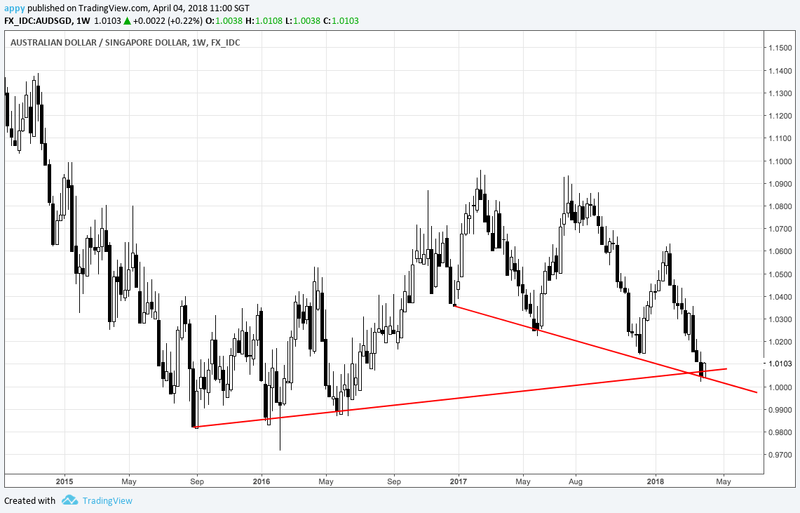 AUDSGD weekly chart shows the pair sitting at a confluence of two significant trendlines. One goes back to mid-Q3 2015 and the other goes back to late-2016. Both lines are long which makes their convergence pretty significant as well. AUDSGD has been falling most of the time since a turning point 9 weeks ago so it is easy to wonder if the pair is oversold and due for a rebound/reversal. Before rushing to go long, keep in mind a simple guideline: a 9-week trend (going into the tenth) doesn’t reverse in 1 week. We should not go long AUDSGD simply because there is a potential support. The ideal time to go long is when price sends a signal that it is terminating the current downtrend to go up. This is a daily chart of AUDSGD from Tradingview.com overlaid with weekly boxes. Green boxes show upweeks and pink boxes indicate downweeks. At the bottom of the chart we can see two trendlines found in the weekly chart↑ converge. This convergence explains why AUDSGD is up this week and gives us confidence that 1) price action acknowledges the support and 2) we are on the right track so far. Can buy yet? Not so fast. As I brought up earlier, one upweek at a potential support does not reverse a 9-week downtrend. There has to be a signal or indication. If we look at price action from the rest of this AUDSGD daily chart, we can find such a signal. Starting from the left, note that AUDSGD was in an uptrend mode from late last year to late January. The most conspicuous sign of an uptrend is the sequence of higher highs and higher lows printed. This uptrend was terminated in the last week of January by a bearish expansion. A bearish expansion is a price action that expands below the previous low hence terminating the previous sequence of higher highs and higher lows. 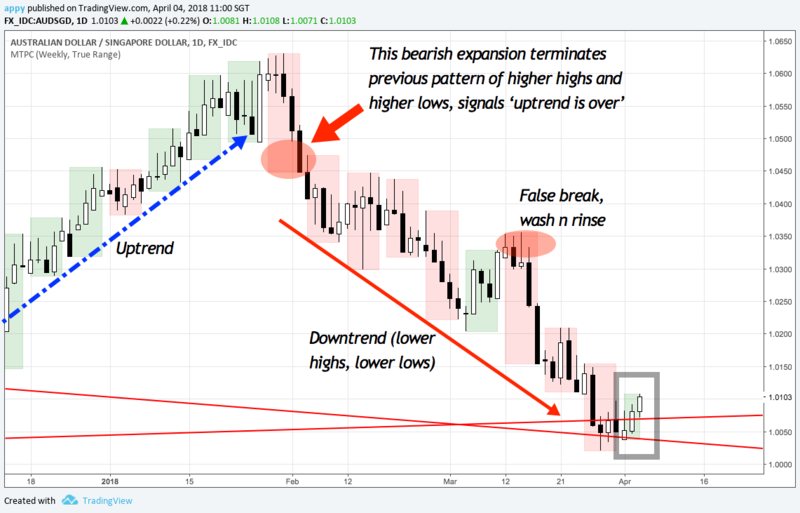 The bearish expansion signals that uptrend is over and once price goes into lower higher and lower low sequence, we know that we have a downtrend. Occasionally price does a false signal: we call it false break or wash n rinse. There are many articles on false break you can look here, here and here. Although we have a potential support from the confluence of two significant trendlines and we have an upweek, is there a buy signal or a signal that trend will reverse? Not yet. If a bearish expansion signals the end of an uptrend, a bullish expansion must terminate the downtrend. At this point, there is no bullish expansion, no termination. Look for an entry after a bullish expansion signal. A bullish expansion tells us we have a higher probability of success: we have trend and timing on our side. Without a bullish expansion, potential support could remain just potential. Without bullish expansion, we could be buying into a mere retracement and not a real reversal. Without a bullish expansion, we could be right eventually but make the mistake of being too early.